Once again we are back for another favourite five! 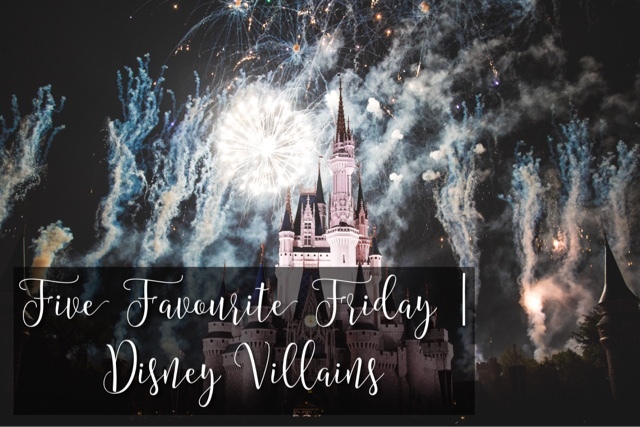 My turn to choose the topic for this week means it’s a Disney one! But I’m going for villains this week. Very often the villains are underrated and often go unmentioned after the movie is over. You know a villain is a good one when they make you so angry that they even exist. Let’s take Harry Potter for example. Everyone remember the horrid woman who took over from Albus Dumbledore as Headmistress of Hogwarts? Professor Umbridge? Loves cats a bit too much? I had a genuine hatred for her. She’s not even a real character! That’s what makes a good villain! On to my top 5 Disney Villains then! We are going for villains from Walt Disney Studios films rather than including Pixar films. We’ll save those for another day! 5. Kaa (The Jungle Book, 1967). I love and hate this character. I love Kaa because I happen to have a bit of a soft spot for reptiles, and find that people find them scary when there is no need to. But I hate him because he’s such a good villain. It’s the love/hate relationship I have with Kaa that puts this slippery snake on this lisssst instead of Shere Khan. 4. Captain Hook (Peter Pan, 1953). Another love/hate relationship with Captain James Hook. I hate him because he’s a grown man out to get a young boy! How insecure must he be that he feels that is necessary? However, since the character appeared in the ABC show Once Upon A Time, I have a huge soft spot for him. The character in OUAT is a real smooth talker and I am actually extremely fond of Colin O’Donoghue’s portrayal of the character. 3. Ursula (The Little Mermaid, 1989). She steals a young girls voice to steal her beauty. She collects seafolk. She’s one weird sea witch. 2. Scar (The Lion King, 1994). He kills his own brother out of pure jealousy and drives his nephew away so he can take over as King. Wow. Jealous much? 1. Mother Gothel (Tangled, 2010). Need I say much about her? She’s so insecure that she kidnaps the King & Queen’s daughter and raises her as her own, all because she wants to use the girls magic hair to remain young? I think underneath it all she’s a bit misunderstood, but that doesn’t change the fact that she comes across as pure evil. In this case, mother does not know best. And that’s it. Do you agree with my list? Who would be on yours? Head on over to Tim’s post on Broken Thoughts to see his top 5 and to see what the topic is for next week! Previous Post Five Favourite Friday | Animals at Dudley Zoo!